I genuinely love the off-season and this is apart of the reason why. Reading up on rumors and new acquisitions, and of course praying on a nightly basis that the owners will sell the team (to me, of course). However, I digress. Let’s take this time to read about one of the newer acquisitions from the Mariners, Edwin Diaz. 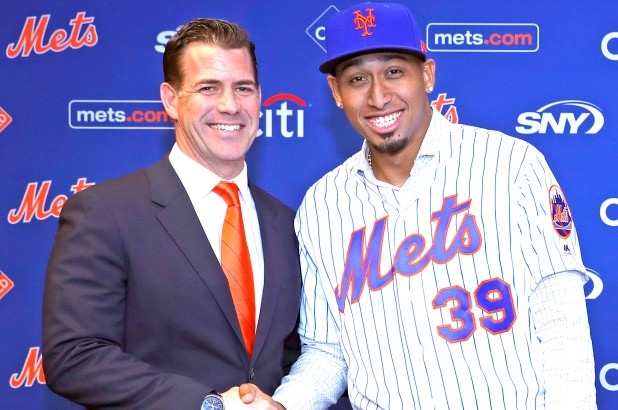 The Mets received Diaz along with Robinson Cano for Jay Bruce, Anthony Swarzak, Justin Dunn, Jared Kelenic, and Gerson Bautista. Dunn and Kelenic project to be stars within the next few years so even though the Mariners chipped in $20M, the Mets still paid a hefty price. While Cano is the one with a bloated contract and is on the decline, Diaz is the kind of player that would negate all the negatives tied in with the remainder of Cano’s deal. Executive’s are predicting that Cano has another 2-3 years of productivity left in his five remaining years. Mets fans should find comfort in knowing that there’s a solid reliever in the backend of their bullpen for years to come. One person that’s finding comfort as well as excitement is sophomore manager, Mickey Callaway. Diaz was drafted by the Mariners in 2012 in the third round and debuted for Seattle in 2016 where he pitched in 49 games, 51.2 innings, and owned a 2.79 ERA in his rookie season. In 2017, he tossed 66 innings in 66 games while striking out 12.2 K’s per 9 innings. However, last year in his age 24 season, pitched 73.1 innings in 73 games and struck out a tremendous 15.2 batters per every 9 innings. He has 109 saves over his three seasons in the majors. As of now, Diaz is slotted to pitch the ninth to close out games but the Mets are still in the market for another late inning reliever. Previous Can Cespedes help Puig? Next Are the Mets making progress with Andrew Miller?